Chinese congee is a rice porridge traditionally eaten at breakfast – but it many prefer it for lunch or dinner. It can be prepared ad hoc, but soaking the rice grains overnight allows them to break and fall apart faster and easier when cooked, making for a smooth porridge. There are many ways to adapt the recipe. For example, with a runny egg, duck confit or smoked haddock. This comforting dish fits the current all-day-breakfast trend. Leave the rice to soak overnight. Slice the ginger and add to the chicken stock with the star anise and the cloves. Bring to a boil and add the rice. Stir frequently to break the rice grains and cook until you have a smooth porridge. Score the skin of the pork belly. Season with coarse sea salt and fennel seeds, rub well into the skin. Cover and place in the refrigerator overnight. Baste the skin with sweet soy sauce and slow roast the pork belly on low heat until tender. Chop the shallot and the chili pepper. Heat the oil in a wok, add the clams, the shallots and the chili pepper, deglaze with the sherry and cook until the shells open. Thinly slice the spring onions, chop the cashew nuts. 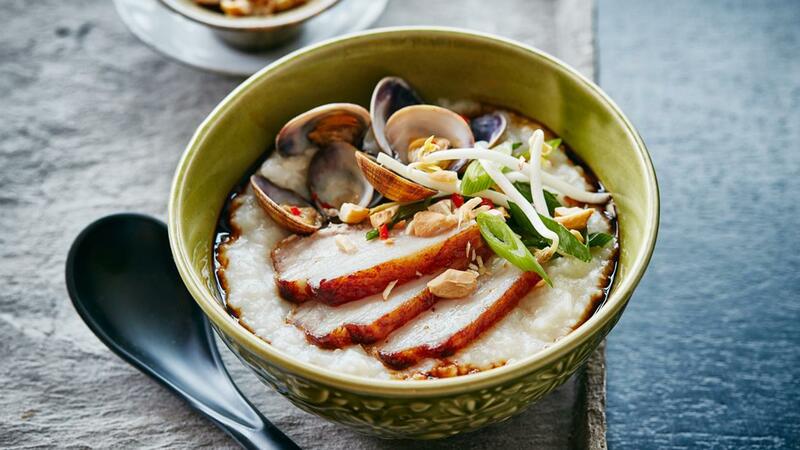 Divide the porridge over bowls, put pork belly slices and clams on top. Drizzle with soy sauce and garnish with bean sprouts, spring onions and cashew nuts.